Just as parasites do, cancer depends on its host for sustenance, which is why treatments that choke off tumors can be so effective. Thanks to this parasite-host relationship, cancer can grow however it wants, wherever it wants. Cancerous cells do not depend on other cells for survival, and they develop chromosome patterns that are distinct from their human hosts, according to Peter Duesberg, a molecular and cell biology professor at the University of California-Berkeley. As such, they're novel species. He argues that the prevailing theories of carcinogenesis, or cancer formation, are wrong. Rather than springing from a few genetic mutations that spur cells to grow at an uncontrolled pace, cancerous tumors grow from a disruption of entire chromosomes, he says. Chromosomes contain many genes, so mis-copies, breaks and omissions lead to tens of thousands of genetic changes. The result is a cell with completely new traits: A new phenotype. 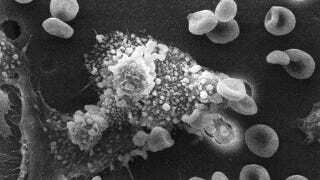 Cancer as evolution in action, which represents a fundamental re-thinking of the disease, has been proposed before-evolutionary biologist Julian S. Huxley first described autonomously growing tumors as a new species back in 1956, according to a Cal news release. But the prevailing view has long been that cancer is the result of genetic mutations. Oncologists and pharmaceutical researchers are studying ways to find and block those mutations, aiming to turn off the switch that sparks carcinogenesis. But gene therapy has largely failed to deliver many meaningful results. Duesberg argues, controversially, that it's misguided. Chromosomal mutation, called aneuploidy, is the cause instead, and it destabilizes chromosomal patterns. Some of the disrupted chromosomes are able to divide, seeding cancer. The result is a new chromosomal pattern that is distinct from our own. The Cal news office explains this in much greater detail. Duesberg said he hopes this theory will spark new types of cancer diagnosis and treatment. Chromosomal tests could potentially pick out aneuploidy very early, before the damaged chromosomes have had a chance to divide, for instance. And new treatments could target the chromosomal disruptions, rather than knocking out or switching off genes.